Benign clearance work at Thrupp Lake in preparation for creating the Radley Wetlands Environmental Centre began on Friday. About a dozen members of Northmoor Trust’s “Friday Work Team” descended on the Sandles property on the edge of Thrupp Lake, and, throughout the day, were joined by a roughly equal number of local volunteers, who included parish councillors and members of Save Radley Lakes, to start clearing and tidying up the site and removing litter from the shores of the Lake. The garden at Sandles had become very neglected and overgrown, having seen no maintenance for nearly 5 years. Litter of all sorts has been steadily accumulating around the lake. 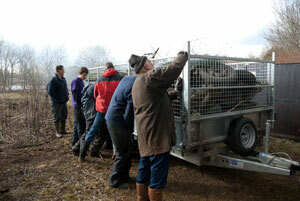 During the course of the day, a considerable amount of litter and general waste was collected and removed from around the site, enough to fill a large trailer. The guard post overlooking the lake, a relic of events that took place in 2007, was demolished and vegetation cut back to open up parts of the site that had become inaccessible. 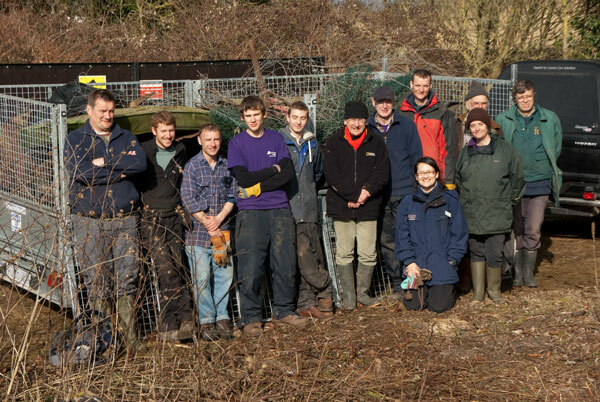 Northmoor Trust personnel and volunteers with the large trailer load of rubbish collected from the Sandles garden on 12 March. Although the day was interrupted by a couple of heavy showers, there was a little sunshine too and the weather was less cold than it had been a day or two previously. All in all it was an excellent opportunity for people to get out in the fresh air and enjoy themselves doing useful work in beautiful surroundings. It was also an opportunity for local people to meet members of the Northmoor Trust team who will be taking care of the Lake in the future. … and finally smashed to bits. This is the first of hopefully many such Community Work Day events involving Northmoor trust working with members of the local community, at Thrupp Lake. 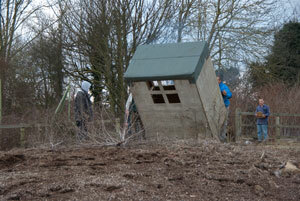 The Northmoor Trust plan to re-landscape the garden area and to build an environmental centre on the site. That will take several years to bring to fruition. In the meantime, there remains a lot of rubbish on the site still to be removed, (including possibly the whole of the existing house!) 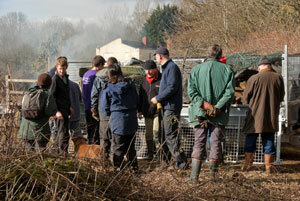 and a lot of tidying up to do to repair the damage and neglect of the past few years. and securing the load before taking it away.